While there is a lot of attention on the rising power of China, the stuttering development of India, and the potential of Brazil and Russia, think ahead to Africa. 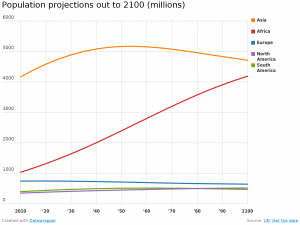 The Washington Post has written a nice piece about the rising demographic might of Africa, based on UN projections. Barring major catastrophes (famine, disease, war, environmental collapse, or all of the above) the population of sub-saharan Africa may quadruple to over 4 billion by Century’s end. Click on the chart for a larger interactive version. This is driven by the high birth rates in many African countries, relative to the declining ones in the West and many Asian countries. 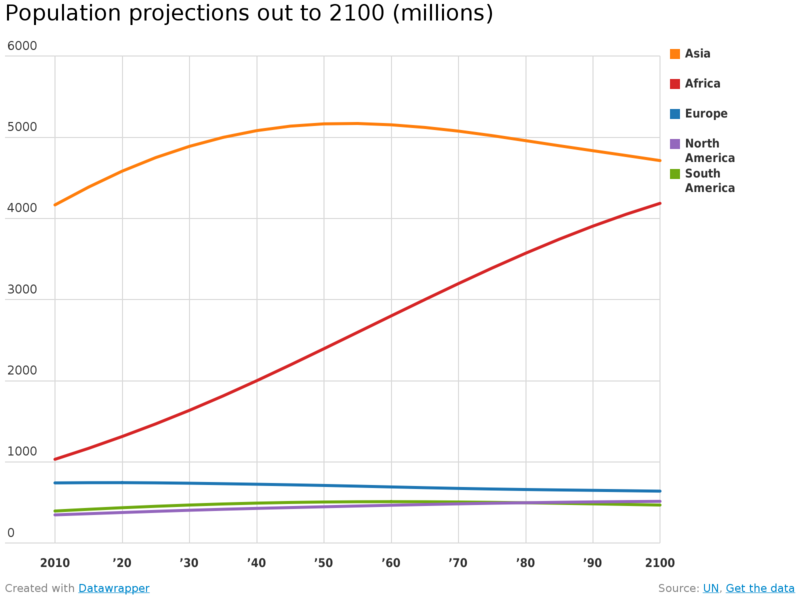 Nigeria alone could have 1 billion people by 2100. Economies as well as populations are also rapidly increasing. Six of the ten fastest growing economies are in sub-Saharan Africa (although this can be partly ascribed to the very low economic base they started from). An analysis by the Boston Consulting Group and the Tony Blair Africa Governance Initiative shows that some African countries are also doing remarkably well in translating strong economic growth into improved well-being. Others haven’t translated rising GDP so equitably. The turn around in the fortunes of some African countries has been attributed by Steven Radelet to a range of factors – greater democratization, improved economic policies, debt eduction, new technologies (particularly mobile phones), and a new generation of leaders. Edward Miguel also adds in education. The wealth of highly desirable natural resources that lie within Africa have also played a considerable role (and will continue to). Many of the multinational consulting firms are helping educate firms about the opportunities in Africa. Z-punkt, my favourite foresight company, is providing a service to assist firms with their decision making [Pdf]. Looking at the travails of India it is clear to see that having a democratic system of governance by itself isn’t sufficient to create equitable economic and social well being. There is a growing African middle class, although, as in many other countries, growing inequalities can be a significant risk. A renewable energy revolution also appears to be underway. This has the spillover benefits of improving education and health. Its not all golden glow though. There are still many corrupt and poorly governed countries, rising ethnic and religious tensions, rapacious habitat destruction and resource stripping, lack of infrastructure, health care and education, crippling food and water shortages, and plenty of nasty diseases. While the rapid adoption of mobile phones, and the social and economic innovations flowing from this, is bringing great benefits to Africa, Ndubuisi Ekekwe has sounded a note of caution. Too great a focus on information technology in Africa may be blinding politicians, business people and students to the need to also build capabilities in mining, agriculture, manufacturing, and many other areas of technology. Smart politicians, bureaucrats and business leaders here and elsewhere need to avoid developing a short-sighted view of our future economic and geopolitical partners. The “dark continent” is likely to be much more bright in the medium to long term. 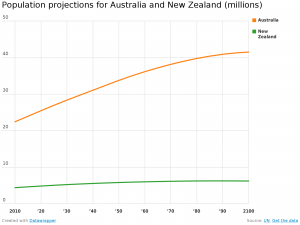 In case your interested, here’s how NZ and Australia’s population projections look using the UN data. Australia’s population may double, while NZ’s hovers around 6 million. Plenty of opportunities and challenges for NZ nearer to home too if these projections turn into reality. The African lion is indeed awakening. Dr Mayaki, CEO of NEPAD (http://www.nepad.org) indicated last week at the 6th African Agriculture Science Week that Africa has enough reserves to takes its place in the global economy. The continent’s population is better educated, and ready for the challenges ahead. The recent speech by Dr Kanayo , executive director of IFAD is a great illustration of the strong will to keep the lion active and roaming!